On Saturday morning, I worked with my students on their income and expenditure analysis and the budget that they formed for their family (we work on both personal as well as organizational/church budgeting). One pastor showed me his budget, which wasn’t balancing, and we looked for options of where he could reduce expenses to help his budget balance. I noticed he had about $33 in his food budget for the month and asked him how many people that was supporting. He said six people…and added that it wasn’t enough. Not an option for cutting expenses. Another pastor had 50% of his income going to rent. No wonder it was difficult for him to balance his budget. Three of my students aren’t working – they are all adults in their late 20s to early 50s – and are trying to survive on about $100/month. Very tough to make ends meet. Not only that, but a key difference between African budgets and American budgets is the number of lines for generous giving. In the US, we usually have one budget line for gifts and offerings. In the budgets I use here, there is a line for tithe, a line for offerings, a line for family contributions, a line for community contributions, and a line for giving to the poor. And there is usually something filled in for every line. One student had 10% for tithe, 36% for family contributions, and about 5% for the others. Over 50% of his income was given away. I finished working with the students on their assignments and left my classroom to go back to the guesthouse. On my way out, there was a bazaar going on at the Evangelical Theological College with lots of different arts and crafts being sold. They were closing up and so I quickly stopped to pick up a few gifts to take home with me and then rushed to the van. 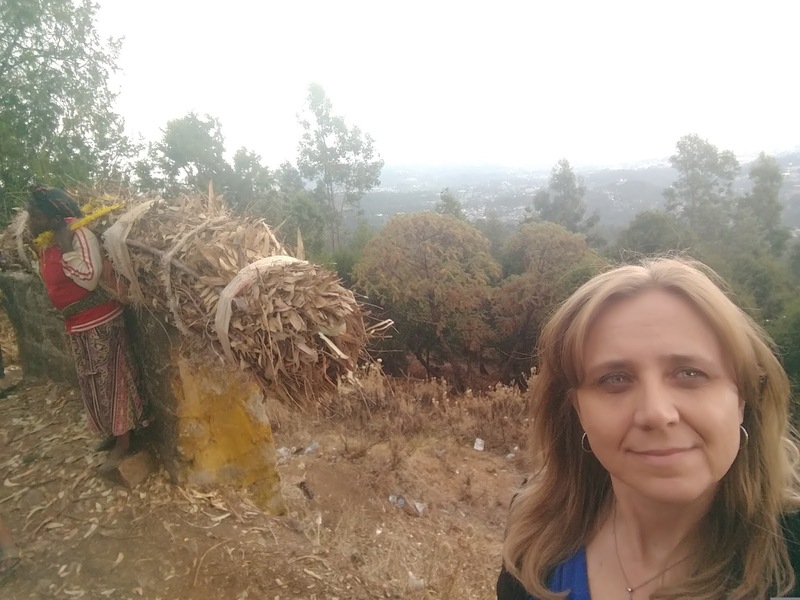 On my wayback to the guesthouse, I realized that what I spent on gifts – without even thinking – was about the same amount that the one pastor spends on groceries for a whole month for his family of six. That sick feeling crept in again. What was I thinking, buying those gifts right after working with these challnges? What can I do? How is this fair? Where is the justice? I can help some of them out for a month or two but then what? And what about the conversation we just had in class about how aid can create dependency? They weren’t complaining. They wanted to figure out how to be stewards with their resources. I hate poverty. I hate the struggle that so many have to go through every day to survive. I hate how slow progress is in addressing poverty, the opportunity to work and provide for themselves, and for people not just to survive but to thrive. 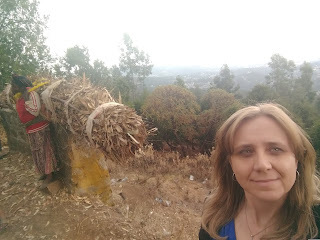 The selfie I have posted here is from Mount Entoto (just outside of Addis) where woman after woman is seen walking down this mountain with this huge pack of wood on their back. Where there was a guard rail to keep cars from going over the mountain, they would take the opportunity to rest their load. Backbreaking work. And my guess is that the profit is very small. While China and India have seen millions of people come out of extreme poverty, Sub-Saharan Africa has actually seen an increase of people in extreme poverty. Watch this clip from the Poverty Cure, which is one that inspires people so much across Africa when we show it. Yoseph Bekele (right), a DML trainer Tafese, and myself on Mt. 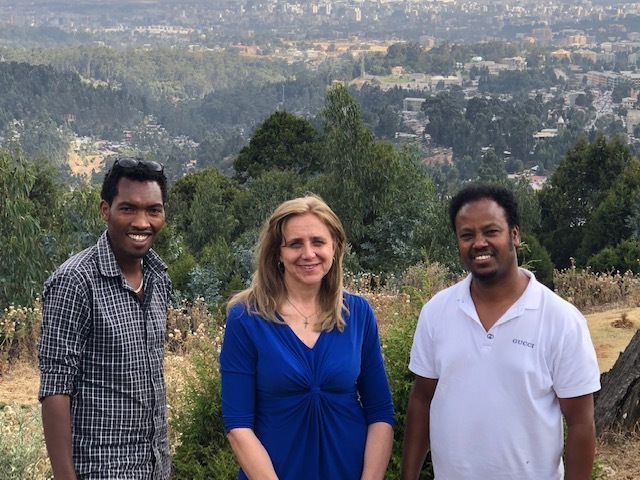 Entoto, overlooking Addis. One of the older Orthodox Churches in Ethiopia, on Mt. Entoto. 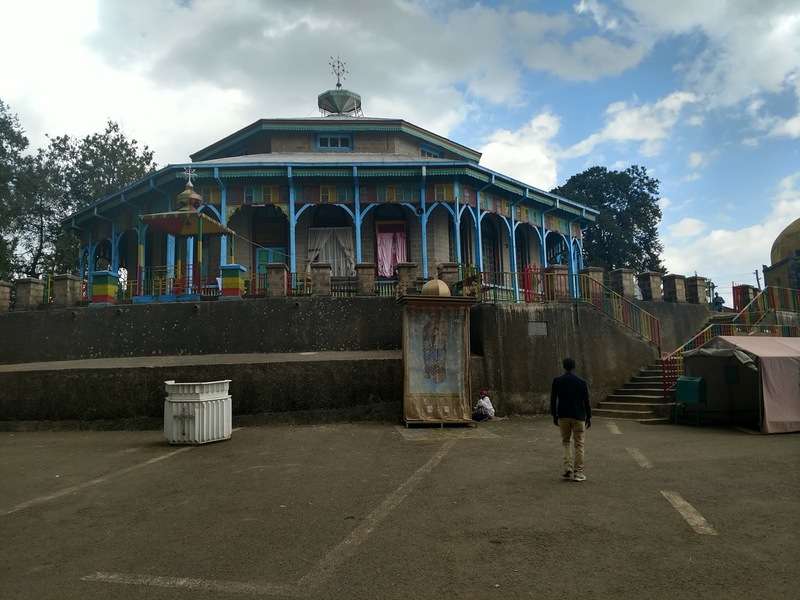 The Ethiopian Orthodox Church represents about 43% of Ethiopians. There are many challenges in this faith, for which there is a need for ongoing prayer. Ethiopia has an amazingly rich history, being the first African nation to recieve both Christianity as well as Islam. Yoseph is doing amazing work as the Business as Mission coordinator for the Kale Heywet Church. He drove us up the mountain in his car which he rolled three times just a few weeks earlier and yet walked away without a scratch. He was able to repair it but it is having some issues. If you would like to contribute to his car repairs so that he can continue to get this word out to 10,000 churches across Ethiopia, please go here and follow the instructions for giving.